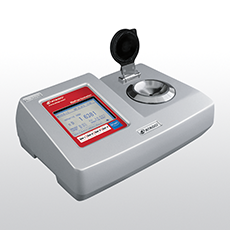 RX-7000α has an improved measurement range of refractive index and measurement temperature. The system is equipped with a thermo module for constant temperature.Â The digital refractometer is best for measuring oils and fats of high melt point, higher refractive index perfumes, organic solvents, etc. RX-7000Î± has the manual calibration facility which compensate difference in standard liquids and measurement values by other refractometers. Related links to "ATAGO RX-7000α"